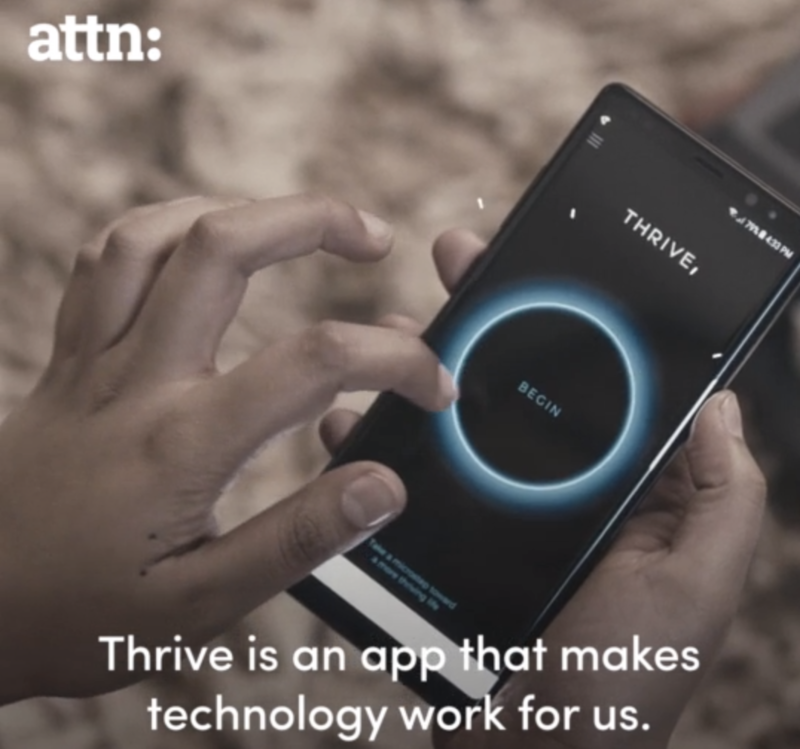 A new video featuring the Thrive App, produced by ATTN: in partnership with Thrive Global and Samsung, explores how we can take back control of our relationship with technology and truly connect with ourselves, others and the world around us. As the video points out, while you’re using your phone to learn new things, create content, meet new people and so much more, you’re also spending the equivalent of 76 days a year looking at it. As study after study shows, so much time spent on our devices has consequences. Being tethered to our phones and screens is damaging our physical and mental well-being, reducing our performance and productivity and taking time and attention away from important experiences. The video vividly demonstrates the range of experiences the Thrive App can help you reclaim and enjoy—from creative pursuits and passion projects to the hard-to-explain, silly, unforgettable moments with friends and loved ones that make life worth living. Turning on the app’s Thrive Mode allows you to take a break from your phone by stopping all incoming notifications and calls for a specified amount of time. There are many positive ways that devices connect us to others, so the app lets you create a VIP List with contacts whose messages will always come through. In addition to, as the video puts it, helping you “put hours back into your day,” the Thrive App lets you set limits and be more mindful of your phone use. The App Control dashboard shows exactly how long you’ve used your phone that day and what percentage of time was spent on each app, complete with an App Blocking feature that allows you to easily set daily limits for specific apps. The video describes Thrive as “an app that makes technology work for us” and these features all help you take back control of your time and your relationship with your phone. If you need help imagining the many things you could be doing with all of that time spent mindlessly scrolling through your Instagram feed, watch the new video above. It’s full of suggestions. The Thrive App is now available for Note8, S8/S8+, and S9/S9+. Click here to download The Thrive App and for updates on upcoming launches.